Our studio units are suitable for 2 people and are categorised as strictly non-smoking. 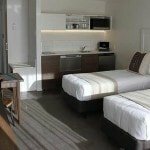 They are self-contained units with en suite bathroom and equipped with an in-room heater and air-conditioning. These provisions allow guests to take in the beautiful outdoors environment. 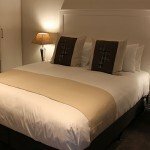 These Wanaka motel rooms are ideally suited for nature lovers. 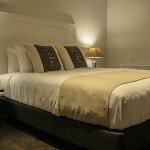 These Studio Units are furnished with 1 King sized bed and a working desk in the room. They are designed to meet the demands of the modern international and local business traveller. They are equipped with free and unlimited WIFI, broadband, radio, satellite/cable TV facilities to Sky – 50+ channels. All this is on a flat screen 55 LCD smart TV. 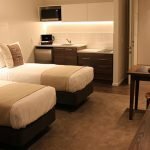 These motel rooms are also suitable for a couple on a holiday or a business trip, wanting to enjoy all that Wanaka has to offer. The room facilities include all the modern and up to date amenities that any person used to a luxurious lifestyle will want. All local calls are free. Room service and breakfast are also on the list of facilities provided along with ample free parking and storage options are provided. The kitchenette is fully equipped with all that you require and includes a hot plate, microwave oven, electric kettle, and a plunger coffee maker. Also contained in these motel units is a bar size refrigerator, a dishwasher, utensils, cutlery, and crockery. The facilities for making tea and coffee are also provided. The service of guest laundry is also provided, with complimentary laundry liquid. Other amenities also include an iron and ironing board. The en suite bathroom facilitates a shower, vanity basin, a mirror, and a hairdryer. It also includes towels and bathrobes for a comfortable stay.